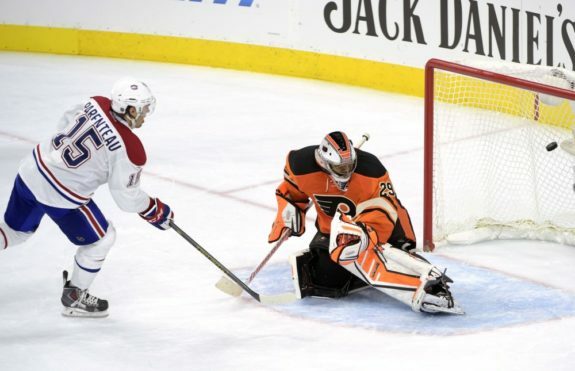 Once again, a Philadelphia Flyers playoff run has come down to their historic ineptitude when it comes to winning a shootout. Sure, they had the miracle win back in 2010 when Brian Boucher stopped Olli Jokinen, but after Tuesday’s loss to the Detroit Red Wings, they are now 42-82 lifetime since the shootout was introduced in the 2005-06 season. Only the Florida Panthers (84) have more losses, and no team has a worse winning percentage, at .338. They have the worst save percentage (.605), third worst in shooting percentage (26.9), third-most goals against (168), and they are tied with the Tampa Bay Lightning for the fourth-lowest amount of shootout goals (115). How did it come to be that the Flyers attained these rankings in a skills competition that gets you an extra point in the standings? The #Flyers (2-7 this season) have 31 shootout losses over the last four seasons, most in the NHL. The next closest are the #Senators with 24. The NHL wanted to eliminate ties in their standings so, back in 2005-06 after a lockout and a successful run in the AHL, they introduced a shootout to decide the winner of a game after regulation and overtime. The Flyers had their first taste of the new way of ending tied games on Dec. 3, 2005, in Nashville when the Predators won thanks to both Steve Sullivan and Paul Kariya scoring on Antero Niittymaki, and the Flyers’ Mike Knuble and Simon Gagne failing to score on Tomas Vokoun. The Orange and Black did not have to wait long for their first shootout victory in the next game on Dec. 6, 2005, as they beat the Calgary Flames. Mike Richards was the only player to score and Niittymaki stopped all three Flames shooters in a 1-0 victory. Overall, they would finish 4-6 that first season, with Niittymaki winning three of those games. The next three seasons the Flyers would go 8-18 combined, though they did have their franchise’s best shooting percentage in 2007-08 (40.0) led by Jeff Carter (3-for-6) and Daniel Briere (3-for-7). They also had their worst winning percentage when they went 1-for-7 in 2006-07, a year they only had two goals on 28 shootout attempts. The Flyers have only had a winning shootout record twice in their history and one was the 4-3 team back in 2009-10. That fourth win was Boucher beating the Rangers on the last day of the season to clinch a playoff spot, and the rest is history. A 22-year-old Claude Giroux was a big reason for the turnaround that season when he went 3-for-5 with two game-deciding goals. Ray Emery was also key to that team’s success, stopping seven of the nine shootout attempts he faced that season, good for a 2-1 record. That team was followed up by three straight losing seasons in the shootout and a combined record of 8-16 in what was the Sergei Bobrovsky and Ilya Bryzgalov era. Bobrovsky, before shining as a dominant shootout goalie and Vezina Trophy winner in Columbus, was only 2-6 with a .480 shootout save percentage. Bryzgalov was equally bad with a 4-7 record and a .470 shootout save percentage. The one bright spot during this tumultuous run was in 2011-12 when rookie Matt Read went 4-for-6; his 66.7 shooting percentage became the best single-season mark for the Flyers to date with a minimum of five shootout attempts taken during a season. From the 2013-14 season to the 2015-16 season, they would only win nine of the 36 shootouts they participated in. In those three seasons, they would have shooting percentages of 28.2, 22.6 and 21.6. Giroux, the most talented shooter on the team, would only score eight shootout goals on 32 attempts during that stretch, including a 1-for-12 season in 2014-15. The one bright spot was when 33-year-old rookie goalie Rob Zepp won his only NHL shootout, besting Pekka Rinne and the Nashville Predators at the Wells Fargo Center. The 2016-17 Flyers might go down as the best shootout team in franchise history. 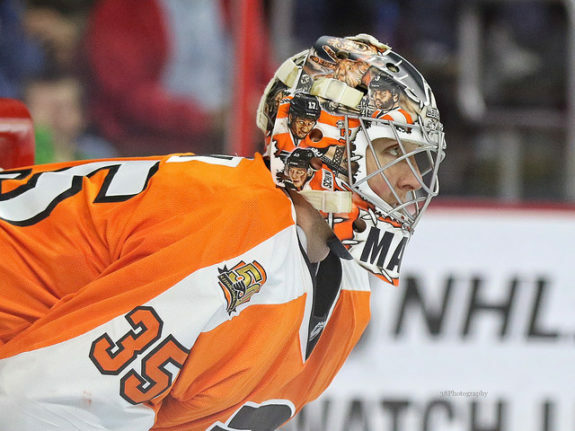 That season saw them go 7-5 while the goaltending duo of Steve Mason and Michal Neuvirth was stopping shots at a record pace of 77.8 percent (35 of 45 shootout attempts faced). Neuvirth was a perfect 6-for-6 in saves that season while Mason, who has a career shootout win percentage of .369, somehow stopped 28 of the 36 shootout attempts he faced. On the scoring side of the puck, Giroux was masterful again, contributing three game-deciding goals, which is the most in any season, but it was Jake Voracek who dominated goalies. Voracek, who is a 34-percent shooter in his career in shootouts, went 5-for-11 that season. Jordan Weal was another good addition to the team as he went 2-for-3 with one game-deciding goal. Though they became the first team in NHL history to have a 10-game winning streak and not make the playoffs, fans were still hopeful that their shootout success would continue. That is not the case this season as Giroux is now 0-for-6, Weal is 2-for-7, and Voracek is 3-for-8. The red-hot goal scorers like Sean Couturier (1-for-4) and Travis Konecny (0-for-4), have not been able to help at all this season. Flyers players, coaches, and fans can only hope it goes up from here.